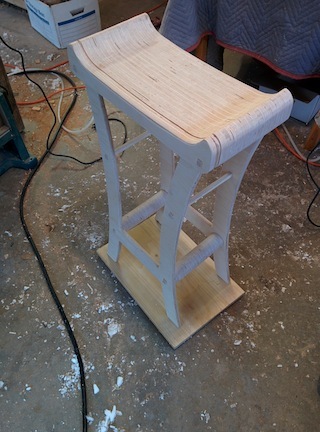 My greatest challenge was coming up with a stool design after working all week before and getting ill on the previous day to the build. 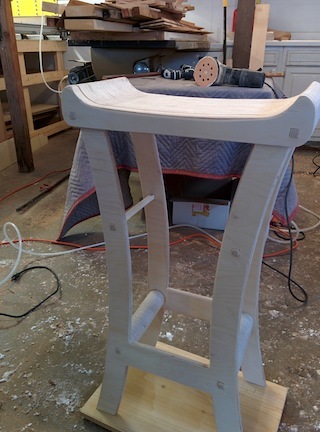 I wanted to come up with a design that I would be able to use my home-built CNC router to cut out. I also wanted to look at using some nice baltic birch plywood that I had around for another project. I believe, the under-appreciated side of plywood is side looking directly at the plys. I choose to highlight that in the construction of my seat. The seat is actually 16 identical pieces and 2 similar longer pieces that make up the height of the chair. It made a nice function stool with lots of area for future improvements. Thanks for putting this on it was nice to get out!